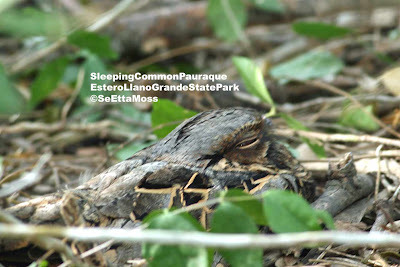 "McALLEN — The Homeland Security Department has sued The Nature Conservancy to condemn land in a South Texas nature preserve for the border fence. 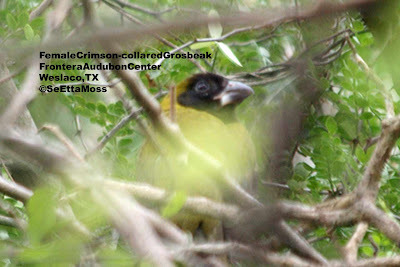 The conservancy’s Lennox Foundation Southmost Preserve, which includes more than 1,000 acres along the Rio Grande near Brownsville, is home to a rare grove of native sabal palms, a South Texas native plant nursery for reforestation projects and habitat for the endangered ocelot and jaguarundi." 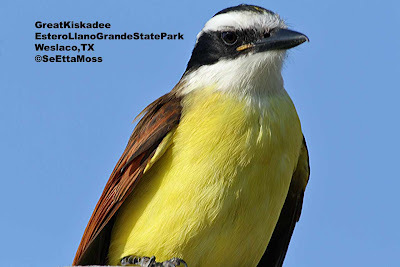 Though these members of the flycatcher family are almost 10 inches in length and bright yellow, they are masters of blending into their habitat, betrayed only by their loud calls that sound to many like they are saying "kiskadee". 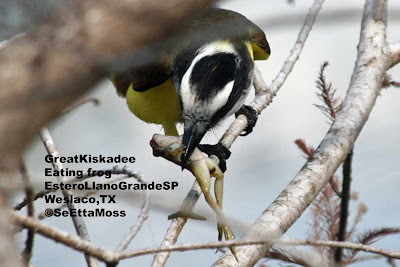 As we were returning to the Estero Llano Grande State Park Visitor Center towards the end of the Christmas Bird Count day before yesterday, this fearless Great Kiskadee perched on a post over the trail and it wasn't giving up it's trail to human interlopers. 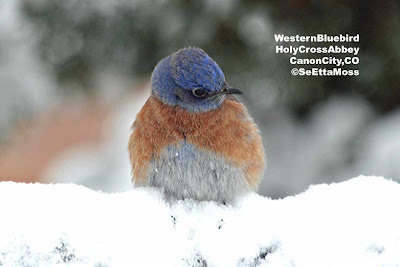 The photo was enhanced by the fact that I was using a borrowed 400 mm Canon telephoto lens with my 1.4 extender. 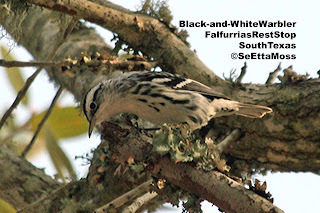 though some of it becomes a little blurry, you can double click on the bottom pic for an extreme close-up view that provides some great detail) The results were great (you can see the individual feathers on this bird) so now of course I want one of these expensive lens. 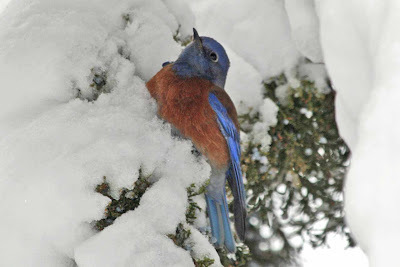 Yesterday morning I got out in the cold (lower 20's) to do some birding before sunrise. 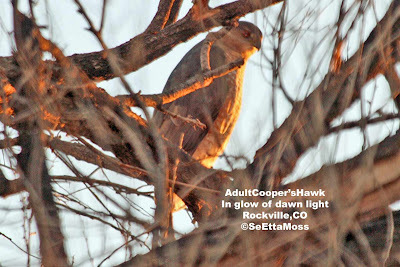 I caught this adult female Cooper's Hawk in the warm glow of the dawn sunlight. 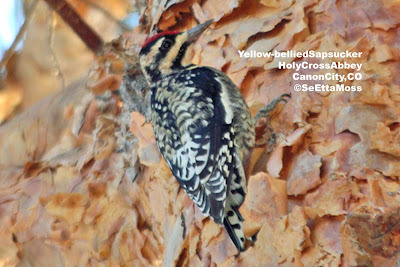 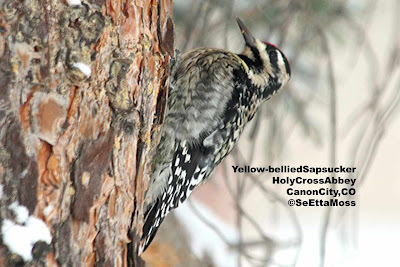 Yellow-bellied Sapsuckers, a woodpecker usually found in the eastern United States, have been wintering in Canon City every year since November, 2003. 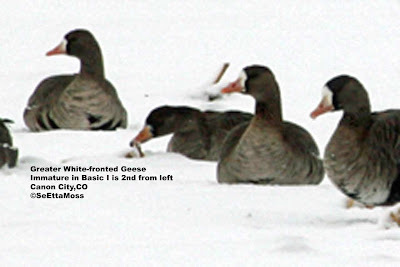 They have also wintered in Pueblo for a number of years beginning before this. 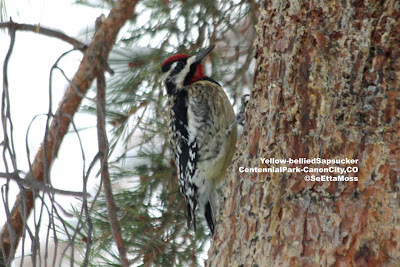 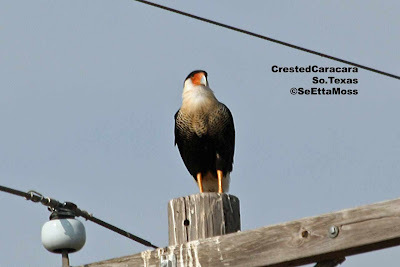 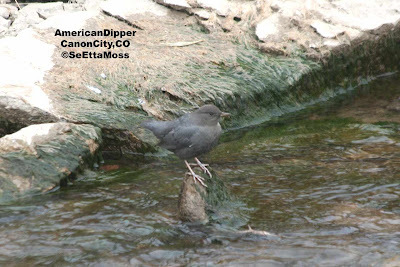 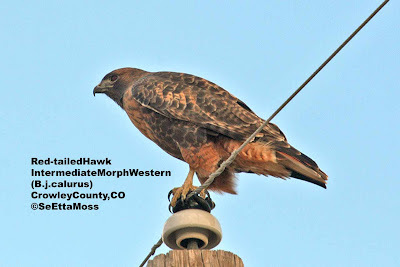 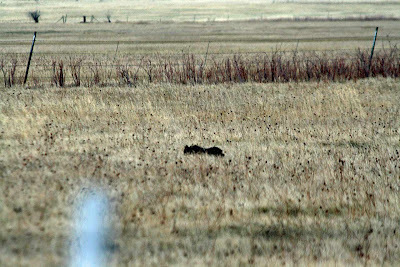 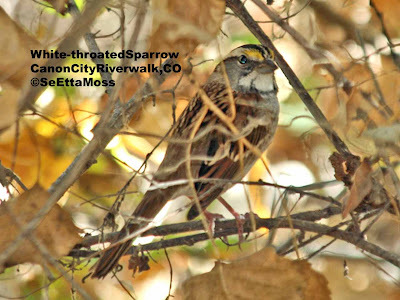 Subsequently they have been found wintering at the Lakeside Cemetery and Centennial Park most years, and in a few other locations in the Canon City area occasionally. 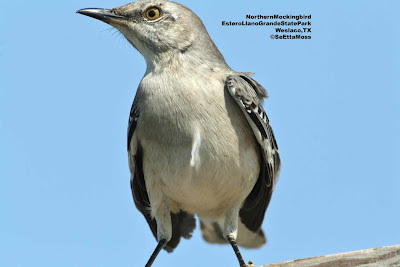 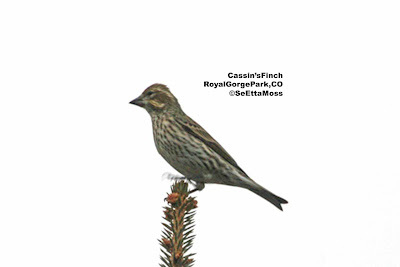 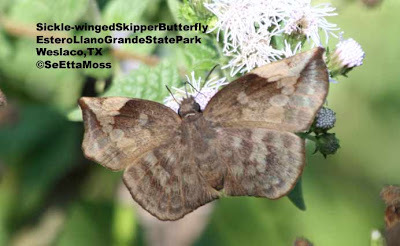 Most members of this species migrate south to the southeastern quarter of the United States, southward to Panama and the West Indies in the winter with females generally migrating further south. 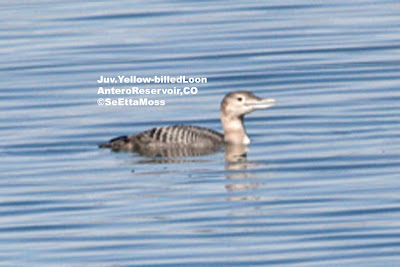 Birding yesterday at Antero Reservoir yielded a number of interesting birds including this Yellow-billed Loon that stayed for several minutes fishing relatively close to shore (compared with many loons that I have seen as distant dots in my spotting scope) as I watched with Colorado birder, John. 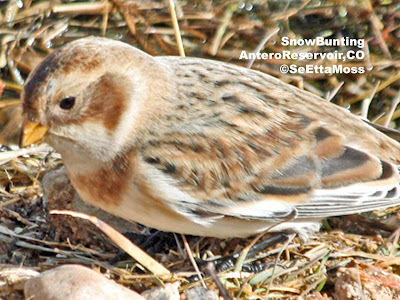 This Snow Bunting was found at Antero reservoir at 8,000 feet by Colorado birders Lock and Glenn yesterday. 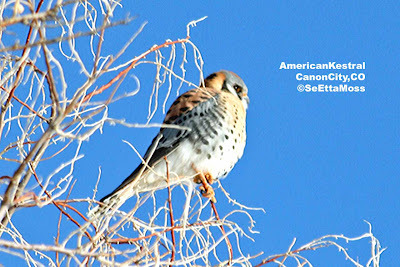 I ran into another Colorado birder, Brandon, and we had been looking for the bird as Snow Buntings are quite rare in Colorado. 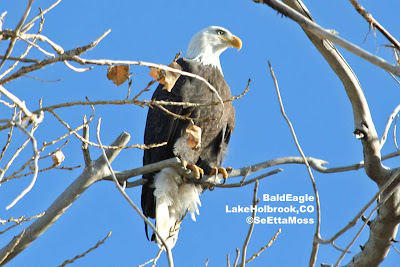 As we stood talking with a fisherman who was inquiring about why so many people were looking for it, it walked between 2 boulders nearby then flew a short distance away. 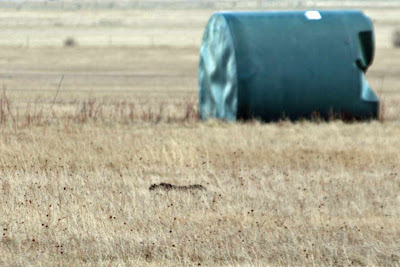 "Yet despite his leadership in global warming and his affection for Teddy Roosevelt, McCain’s record is a political Rubik’s Cube. 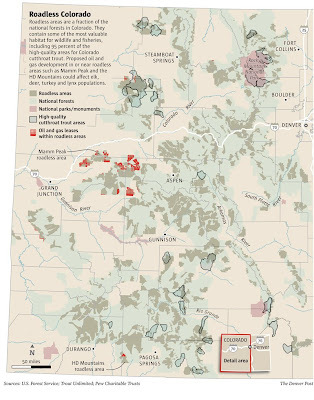 The League of Conservation Voters (LCV) gives McCain just a 24 percent lifetime rating. 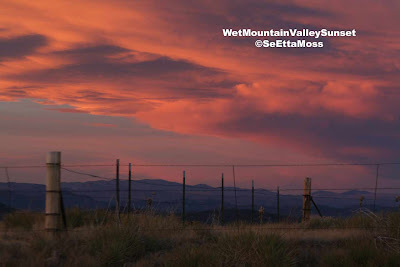 He has rejected efforts to tighten environmental and energy regulations affecting issues ranging from clean air to fuel efficiency—anything, his critics contend, that stood in the way of industry profit."